Heavy downpours that began Saturday night in Turkey's southern Antalya province have caused floods in the Mediterranean resort city. Rainfall began late Saturday grew in intensity in Sunday morning, turning streets into lakes that lifted cars and stranded drivers and pedestrians. One highway in Hisarçandır neighborhood in Konyaaltı district was closed off to traffic due to flooding. Eight vehicles stranded on the road had to be rescued by Regional Directorate of Highways. The directorate took measures against rocks and debris carried along by the flood water. The city was hit the hardest on Sunday by rain, which left the world-famous Konyaaltı beach under unusually-high waves which reached up to 2.5 meters in height. Due to the heavy floods, Boğa Çayı stream in Konyaaltı district overflowed, blocking the access to a bridge in Çakırlar district. The heavy rain also caused the water level to rise in Göynük Canyon in Kemer district. 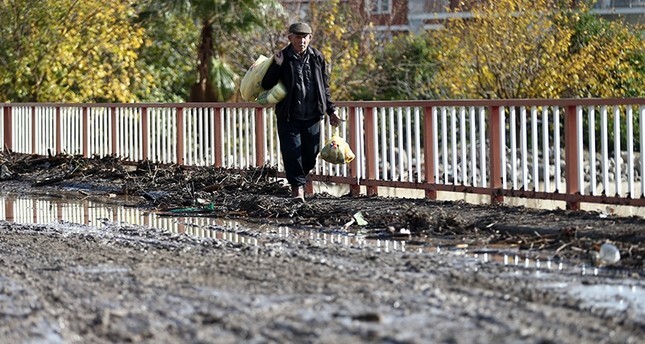 Transportation was completely blocked as the floods covered the bridge between Göynük and Beldibi districts.